Delray beach's best location! 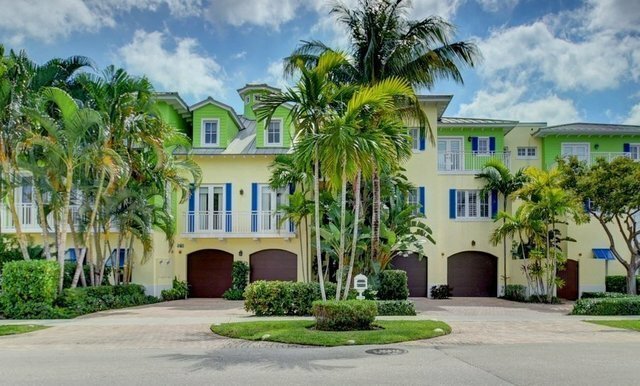 Key West-style townhome perfectly lends itself to gracious living and entertaining. This spacious 3-story residence with elevator comprises 5,060 total square feet including 3,940 square feet of air-conditioned living area with 4 bedrooms and 3 baths. The open-plan with formal and casual living space creates a wonderful area for entertaining featuring a gas fireplace, dining room, pine floors, and French doors to balcony overlooking the tropical backyard. Chef's kitchen is beautifully appointed with lovely custom wood cabinetry and top-of-the line appliances, including a Wolf gas range, Sub-Zero refrigerator, wine cooler, and convection/microwave oven. Upper level features two spacious master suites with large siting areas, ample closets, airy balcony and spa-style bath with plenty of natural light. The entry level has two bedrooms that share a full bath with both rooms having French doors to entreating area and spa.